Look through the lenses of one of Wood Ya’s hip and eco-friendly sunglasses, and you’ll see more than just a savvy design. On view are Al Morrison’s rich family legacy and forward-thinking sustainable values. For Morrison, owner and founder of Wood Ya, woodworking isn’t a mere hobby, but a profession with roots that wind deeply through his family tree. His father and grandfather both crafted furniture and other wood goods, and his great-grandfather Alger owned and operated a logging mill in Pennsylvania called Morrison’s Mill. With a world of woodworking opportunities at his fingertips—and a few excellent mentors—Morrison decided to carry on the family custom and craft a unique product: eco-friendly wooden sunglasses. The shop opened its doors in Fenton, Michigan, in 2013. “Like many people, I’ve lost many pairs of sunglasses out on the lake,” he says. “Wood floats. 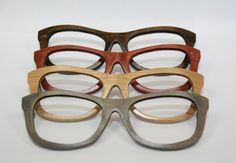 Acetate sunglasses do not.” While some of Wood Ya’s shades float better than others (different woods have different buoyancy rates), they all have one thing in common: every pair is crafted using reclaimed wood culled from property near Morrison’s Mill. Almost every other step of the manufacturing process is also environmentally friendly. For example, to dry out the wood, Morrison and his father built a solar kiln that uses natural heat and energy from the sun to dry the wood without the need for chemicals and manufactured energy. The lenses are made using 100 percent renewable energy sources, and they are angling to have the frame hinges produced in a small company 30 miles away from their current facility to keep the processes as local as possible. “We believe it’s important for consumers to know how a product is made, where it is made, and what it is made of,” Morrison says.